This is a space that I really feel is unique to our house. I'm not sure if it was originally supposed to be a closet or what- but it is a TEENY TINY closet right outside the master bedroom. 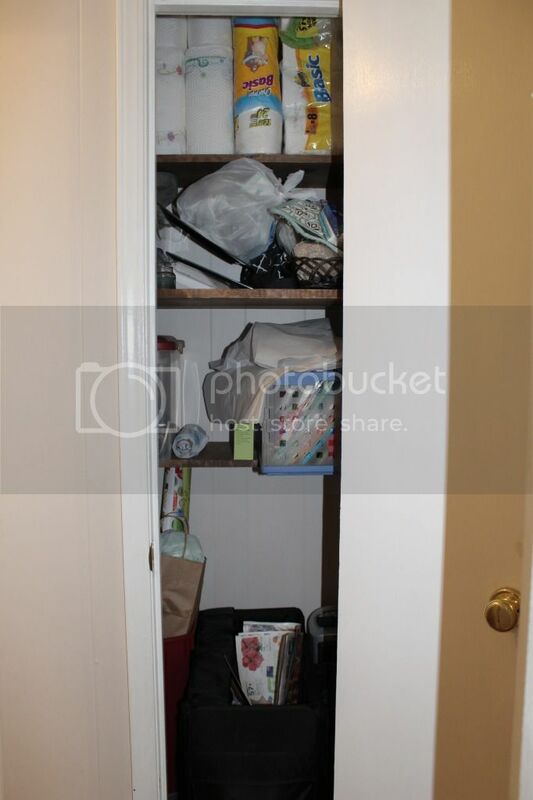 I guess some people would use it as a linen closet, but we have another closet right next door that is an over-sized hall closet. That's where we keep our linens, paint, tool box, emergency kit p1 and p2, vacuum, steam cleaner, and any extra stuff we need to store. So back to the book closet. It's really narrow and fairly shallow. But it's cute. And we have tried to maximize the space. Of course when we first moved in we had no idea what to put in it. But like every other room in the house it eventually found it's calling. I can't even believe when we moved in we had a whole EXTRA bedroom that we just used for storage. Now we wish we had one more bedroom! Just ONE more. It does have a little extra space on each side of the door- but not much. 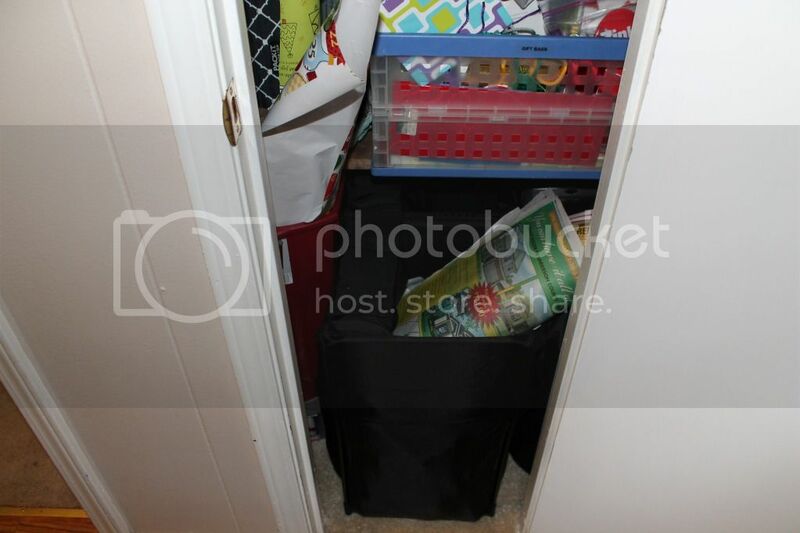 The bottom of the closet holds our recycling bins (from IKEA). One is for newspaper/paper, the other is for glass. To the left is our wrapping paper, and to the right is the air mattress and heater for winter. As you move up- it's becoming more disgraceful and messy. Just wait. 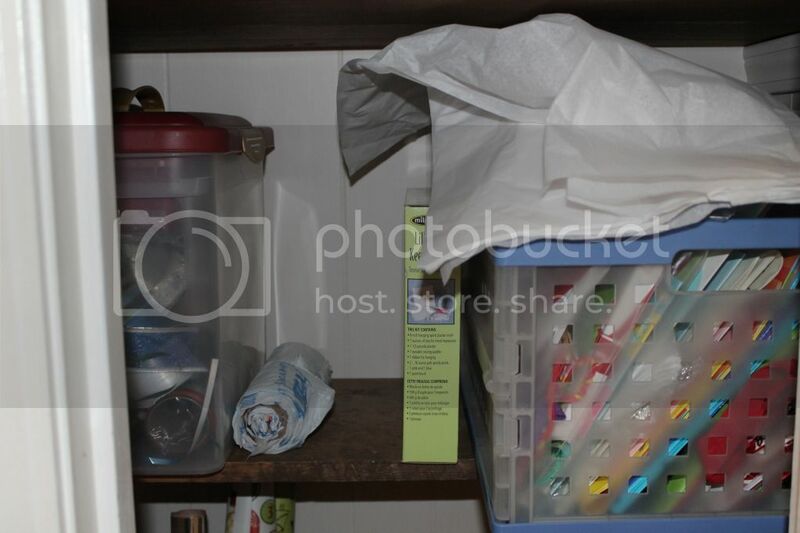 This shelf held our ribbon, random crap, and our gift bags and tissue paper. By the way I have the hardest time with putting stuff back where I found it. It usually gets thrown in, until the next time I need it (see the messy unfolded tissue paper). Then the next time I need something and have a hard time managing everything I'll get frustrated pull it all out clean it up and leave it for the next time. That's just the way I've always been! yikes... Here is just a mess. Random project materials, decorating stuff, gifts, and Operation Christmas Child boxes thrown in there (you can see them peeking out all the way on the left). 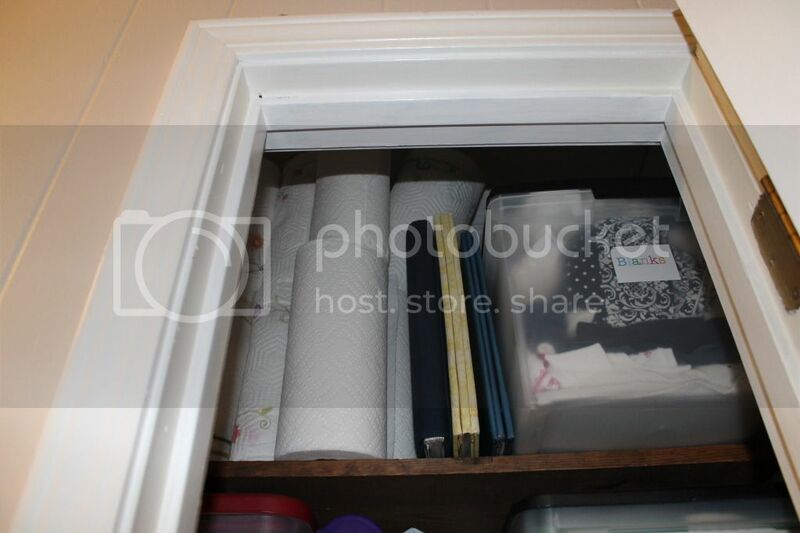 The very top shelf has a lot of wasted space that goes well beyond the top moulding of the closet. I used it to store my couponing extras. Clearly we don't need paper towels for a while. The funny thing? 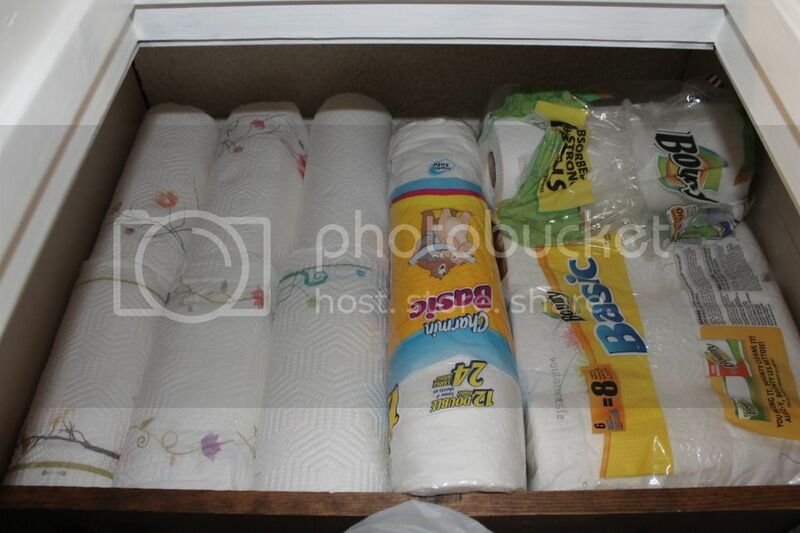 I hardly use paper towels since we went almost completely to cloth (I talked about all that here). You guessed it- everything had to come out. Yep everything. It had to get worse before it got better. Notice I added a 4th shelf in the after pic. There were already brackets installed. All I had to do was add the wood. Because we are re-arranging the office, I needed this closet to hold our memory box, Luke's work, and my blanks box (for embroidery). 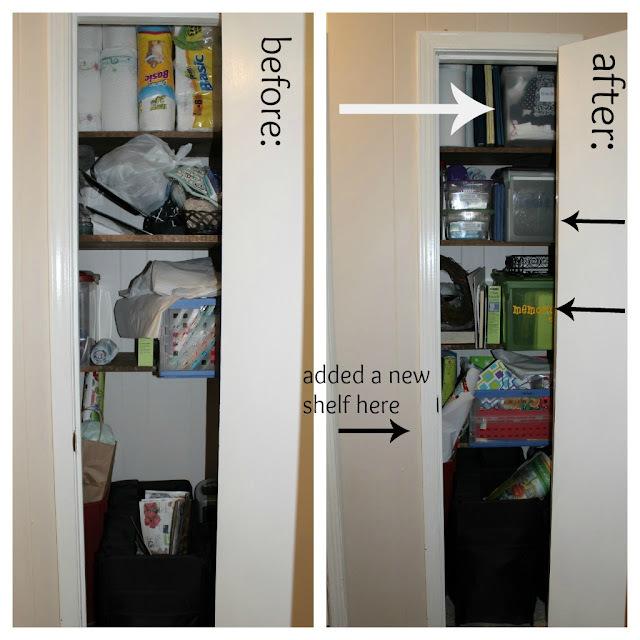 Although the after pic isn't "dramatically beautiful" it is amazing how much more stuff that closet is able to fit now! 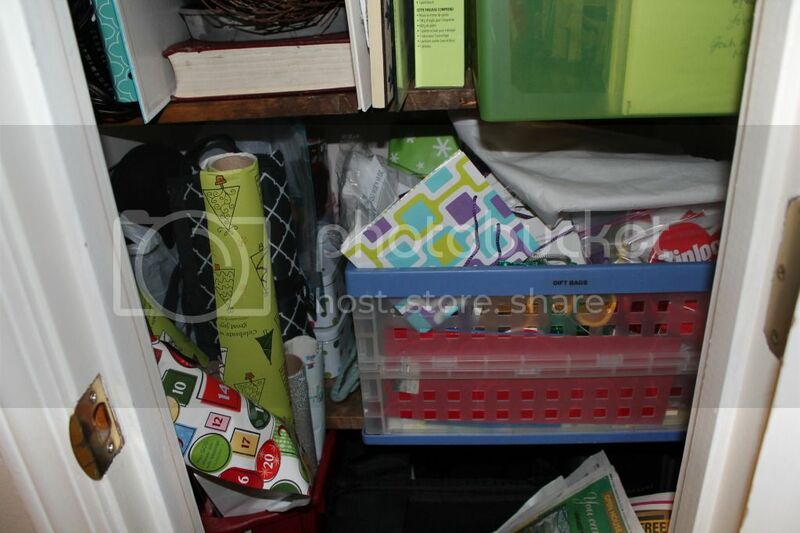 I was able to scoot all the taller than the bin wrapping paper up to the front so the shelf didn't interfere. I do have to pull the recycling bins out to access the wrapping paper, but for the most part I use bags so that's no biggie. 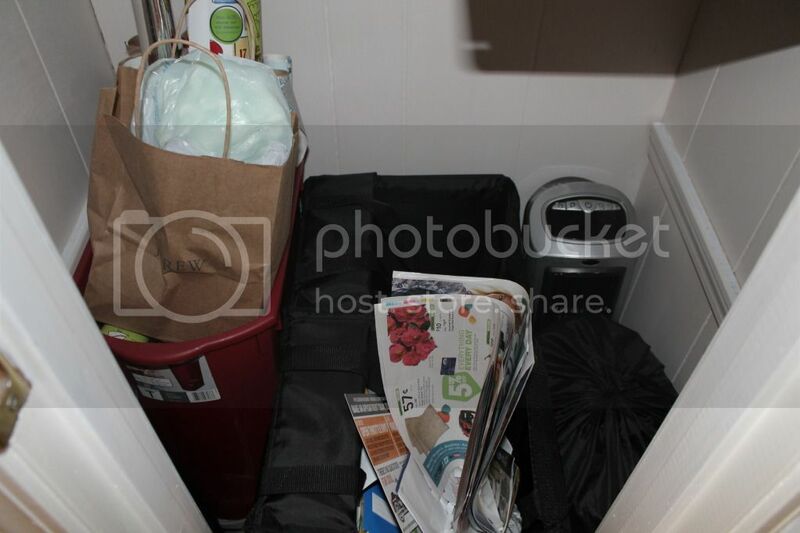 The recycle bins stayed, along with the heater and air mattress. This is the new shelf that was added. 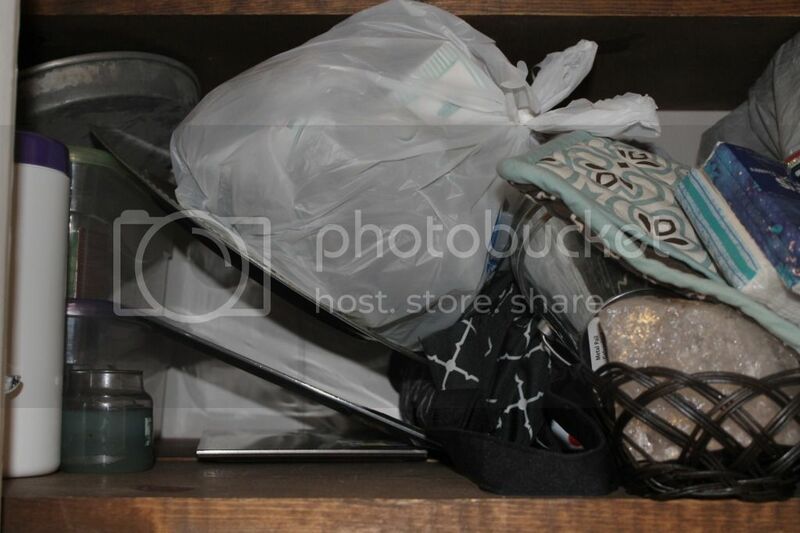 Here I put the gift bags (VERY easy to reach) and gifts that I collect throughout the year for family members (so if you're family- you may not want to peek in that closet- just sayin'). The 2nd shelf from the bottom now hold a brand new box called the "memory box". It also holds projects that are "in process". No new projects until I clear these out! 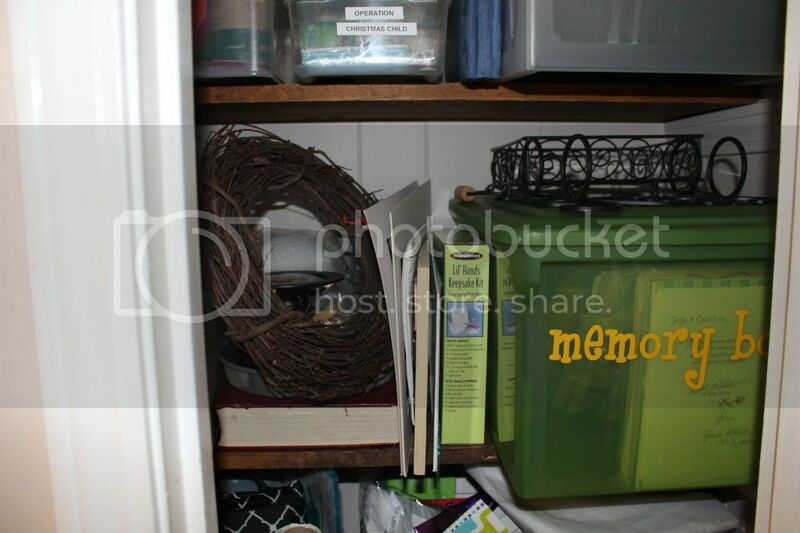 The 3rd shelf holds Luke's work, Operation Christmas Child shoe boxes, and ribbon. I only access this ribbon at Christmas, so it really doesn't need to be accessed easily. The very top shelf still houses my couponing extras. But I am trying to not buy so much at a time. It also holds some random scrapbooks and my blanks box. 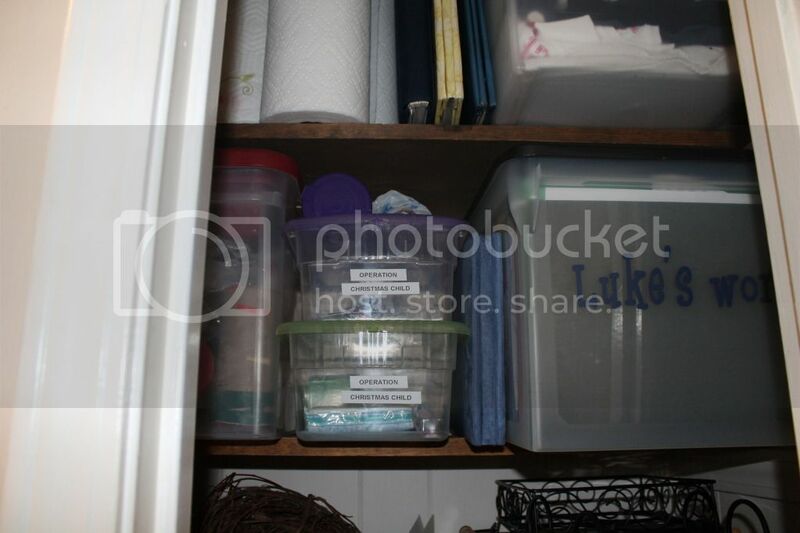 I tried a million ways and the blanks box, Luke's work box, and his memory box would not fit 2 to a shelf. So they had to each have their own. I wish I could have put the memory box and his work box on one shelf since I access them equally- but oh well! I am doing another post on our memory box and Luke's work box. I came across a GREAT idea on iheartorganizing (of course) that makes storing work SO simple (and cute!). I'll post it tomorrow since I think that's enough for today!